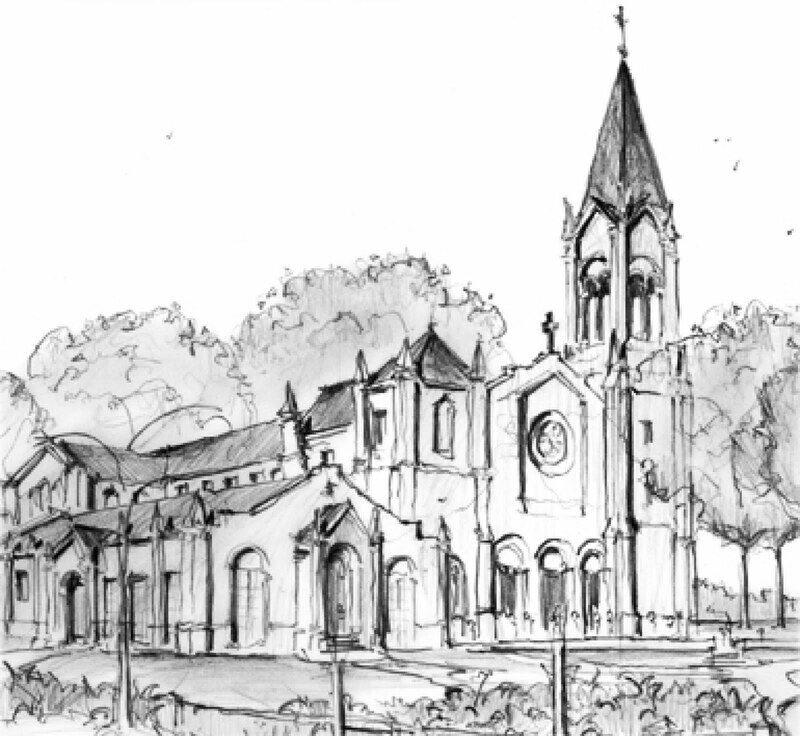 On October 2, under a beautiful and providential sky, St. John the Apostle Parish in Leesburg, Virginia, broke ground on its new, French Gothic-inspired church and fellowship hall complex. As the Most Rev. 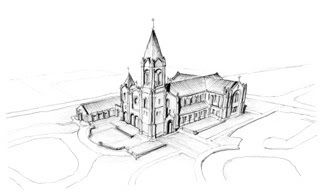 Paul S. Loverde, Bishop of Arlington in Northern Virginia sprinkled the holy ground, St. John’s schola sang a Latin Te Deum marking the culmination of years of effort by the parishioners to build a church large enough and worthy enough in which to worship. The building will seat a congregation of 1,100, and cost an expected $13 million. There was an extraordinary run-up to this event. Fundraising for the new buildings began in fall, 2008, just as the nation began to slip into the worst economic downturn since the great depression. Even as the economy tanked, as millions nationwide were out of work and losing their homes, and as local area businesses ground to a halt, St. John’s parishioners pledged $9 million over eight months, so inspired were they by the vision of a mini-Chartres rising on a low hill on the edge of Leesburg’s historic district. No millionaires were available to underwrite the construction. The average pledge was nearly $9,000 per donor. Sometimes fundraising efforts are divisive, but this one seemed to bring together the parish on a spiritual level. A campaign of prayer was considered more important than the campaign for funds. The congregation at every mass recited an especially composed prayer humbly begging for the success of the effort. A systematic solicitation of participation by prayer groups, school children, and ordinary parishioners recorded 1.86 million Hail Marys recited. As a result, the town’s notorious, obstacle-strewn process of obtaining engineering, architectural and historic district approvals—even detailed reviews of the number of trees that would be planted—seemed to melt away under Our Lady’s prodding. Another reason for the success was the vision articulated by the appointment of a new, dedicated—and young—pastor, Fr. Mosimann. In meetings with parish leaders, it was decided that the new church must respect the central mystery of the faith--the Eucharist--and show the unity of the Crucifix, altar and tabernacle as the elements representing this mystery. The exterior of the new building therefore is cruciform, with a 130-foot tower and steeple, three front portals, a rose window, and a shorter tower linking to a separate fellowship hall with the same French gothic elements. Inside, attention is focused forward to the altar, located under a rood beam carrying a group of the crucified Christ, the Blessed Mother, and St. John the Apostle, the parish patron. After interviewing a number of architects, the parish found what it wanted in the Washington D.C. firm of Franck & Lohsen. 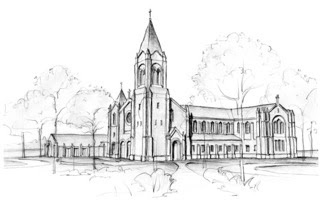 Although the firm never had a commission in the Arlington Diocese before, it has a reputation for classical design and has been responsible for important projects around the country such as the Franciscan Friary and chapel at Hanceville, Alabama, adjacent to the Monastery of Our Lady of the Angels. Michael Franck and Art Lohsen accepted the challenge of St. John’s. At the same time, Leesburg is a different and unique town. Founded in 1758 and named after Richard Henry Lee of Stratford Hall by his two sons, it is the county seat of Loudoun County, and boasts a fairly intact collection of 18th and 19th century buildings. The town is 35 miles west of Washington, D.C. Up until the 1960s the size of the county’s population was virtually unchanged from the first census in 1796. Thirty years ago, it was still a quiet agricultural center where the biggest businesses were the stockyard and the feed mill, and the genteel tone was set by a score of 19th century plantation houses, some of which are now held in public trust. Then Dulles International Airport was built over the plantation of one of the Lee sons, and high tech industry moved in. AOL and MCI flourished long enough to build up a high concentration of highly educated IT engineers and other technical specialists. The global root server of the World Wide Web was established at an undisclosed location in the county. Hundreds of military and intelligence contract startups bloomed after 2001, as well as huge, but nameless government agencies. A new and larger branch of the Smithsonian’s Air and Space Museum was built next to Dulles. A center for cancer and other medical research arose on the fields of Janelia Farm. Tens of thousands of houses were built on the green pastures. Loudoun County became the fastest growing county in the nation. The 1878 Little Church was a humble wooden building built by local carpenters in the days before electricity came to town. In 1936, it was completely transformed by a wealthy parishioner into a version of a medieval French country church, with windows purportedly brought from France, half-timbered porches, statues based on the elongated proportions seen in the portals of Chartres Cathedral, a crucifixion group attached to the rood beam, wrought steel chandeliers in the shape of royal French crowns, and French folk-art motifs stenciled on the beams and pews. The Little Church is still used for two packed daily Masses, weddings, perpetual adoration every Thursday, and Mass in the usus antiquior, that is, the Latin Mass in the Extraordinary Form, on the first and third Sundays. James P. Lucier is a journalist, editor and policy analyst who has been a member of St. John’s parish for 43 years.